October half term is not usually a time of year that we go away on holiday. 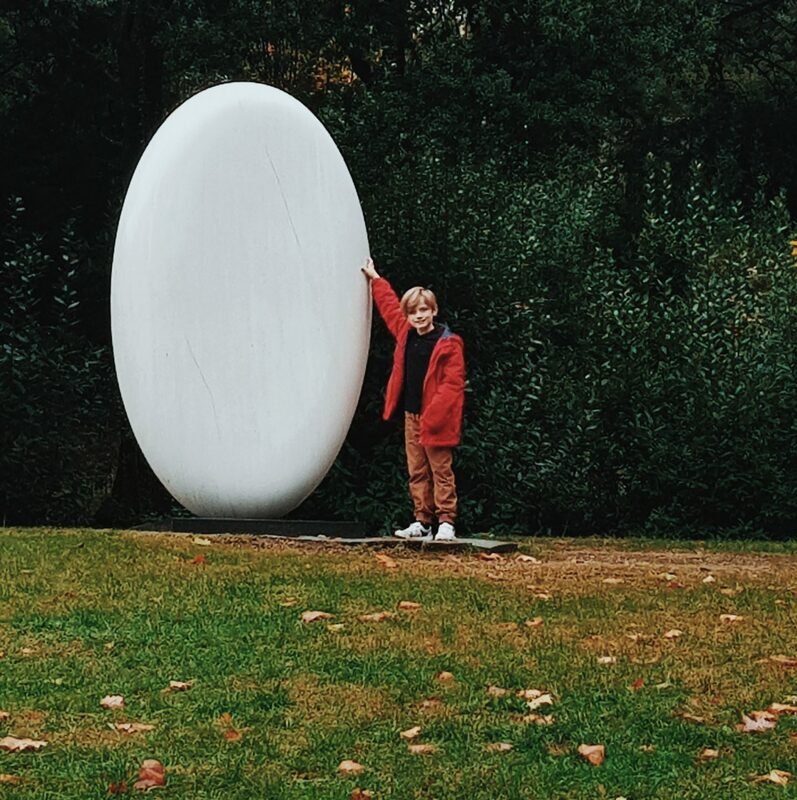 We tend to just enjoy hanging around locally – embracing Autumn and prepping for Halloween. 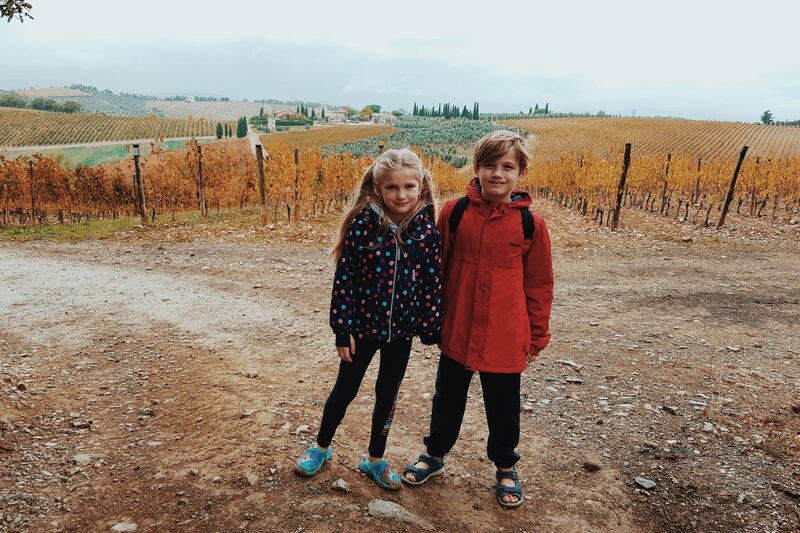 This year however was vastly different, because when “To Tuscany” invited us to visit Tuscany again and stay in one of their villas, seeing Italy in Autumn and catching some last minute sunshine seemed like an Idyllic half term break for us all. 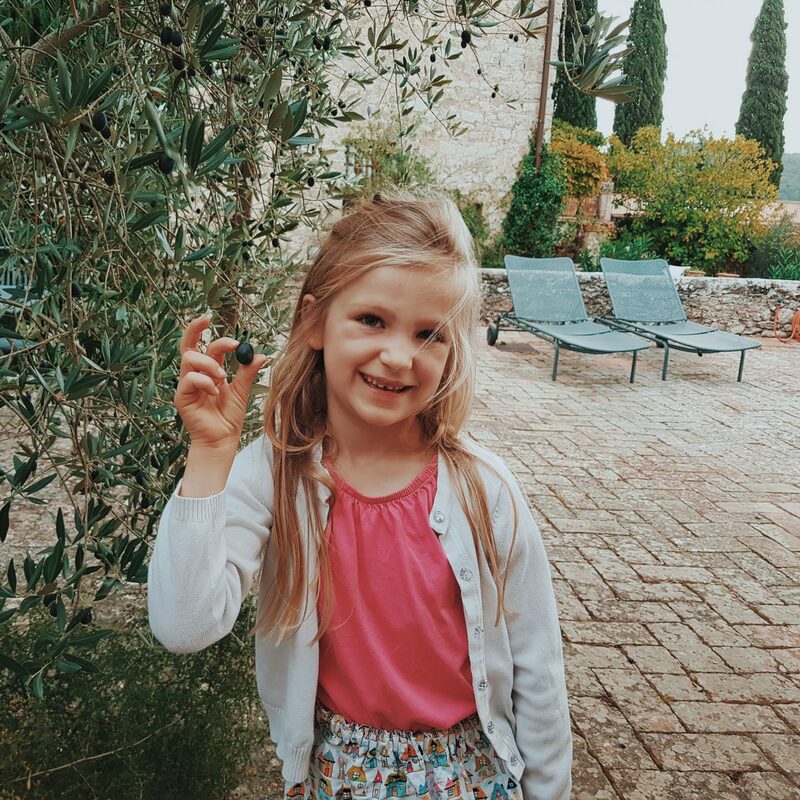 And so, a few weeks ago we enjoyed a lovely little family adventure (with Grandma) in the Chianti region of Tuscany in a quaint little villa tucked in the midst of vineyards. The views were incredible, the weather was wetter than anticiptaed, but it was a beautiful week together. 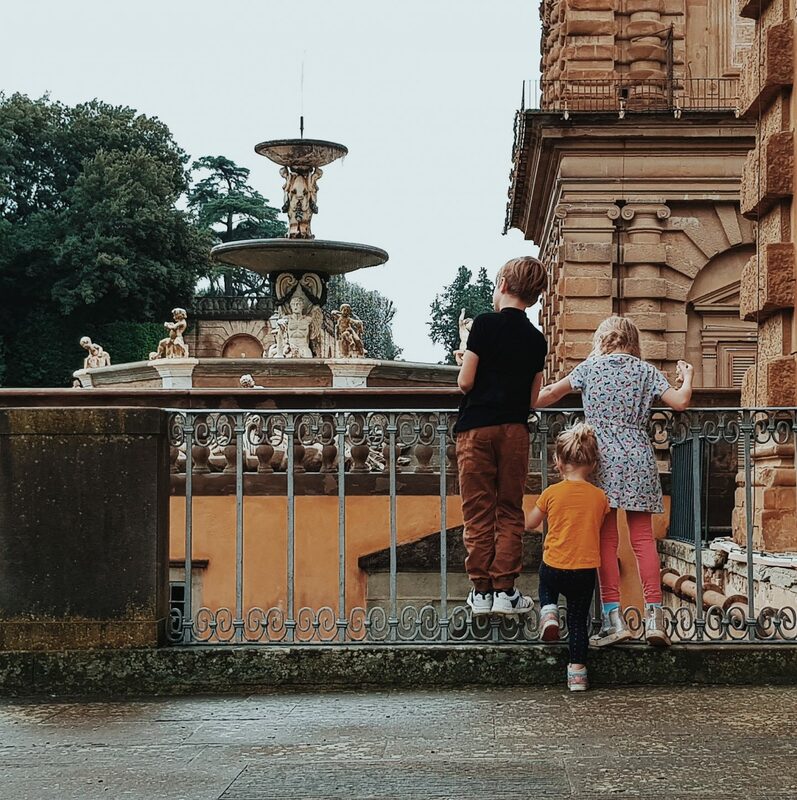 We have been to Italy twice before, but always in the Summer and with the intention to swim in lakes or hit the beach.This time however we were excited to see it clothed in Autumn and do things a little differently. Our Villa was in a teeny place called Montebuoni which is on the hill above Lecchi in Chianti and about 40 minutes north of Siena. This is a region we have never been to before and so there were lots of new places to explore and memories to make. 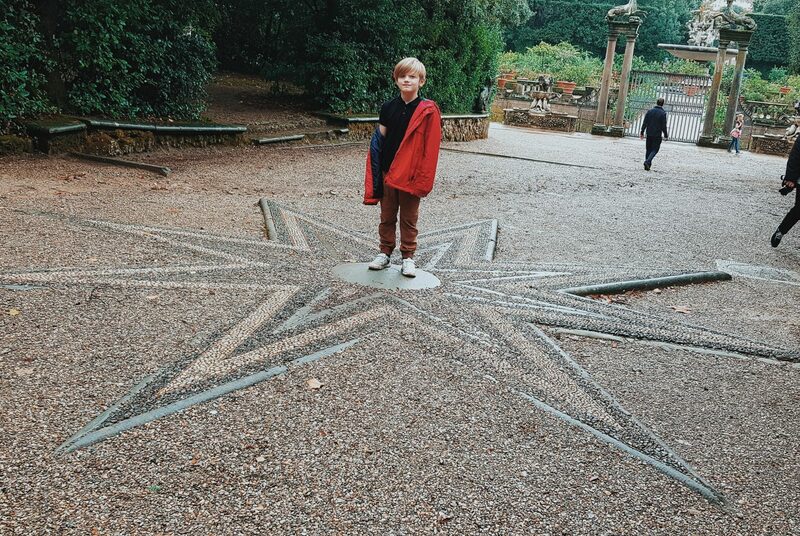 I did some research beforehand and Grandma also had some great ideas too, but in the end the things we did and the places we explored were super interesting, very beautiful and a lot of fun for us all. 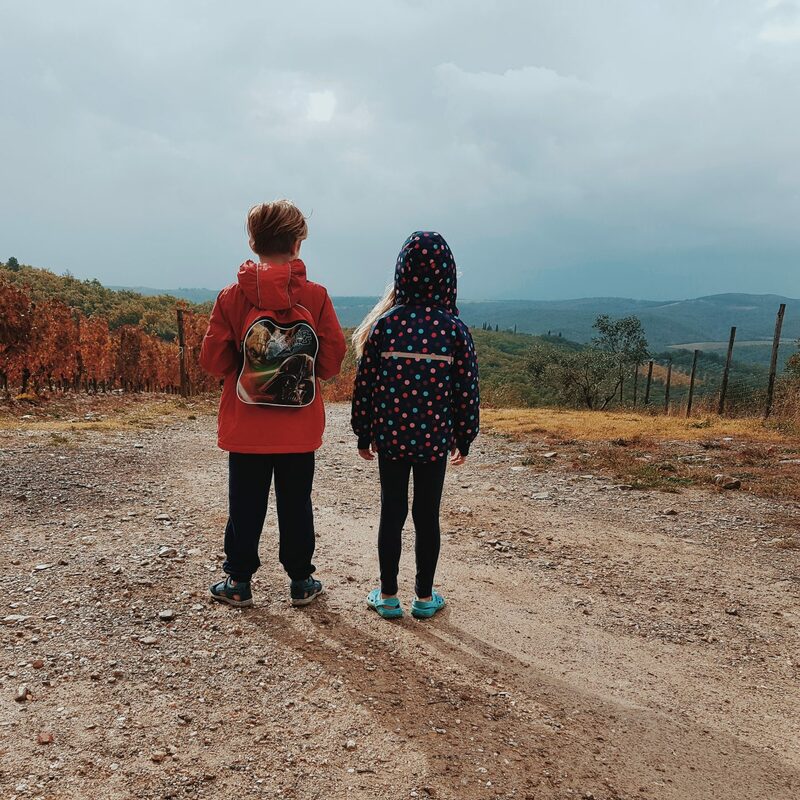 Here is our week in a nutshell, with the highlights and useful things to be aware of when visiting southern Tuscany with kids (whatever the season). 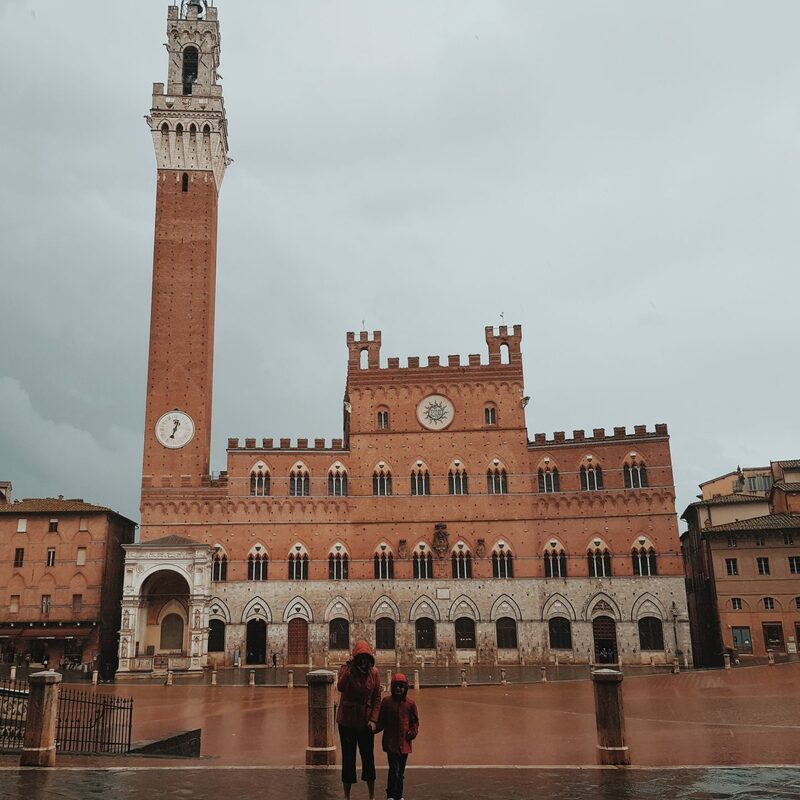 Siena has never really been on my radar as a must see Italian City, however now we have been I would most definitely suggest it as a family day out whilst travelling/on holiday. 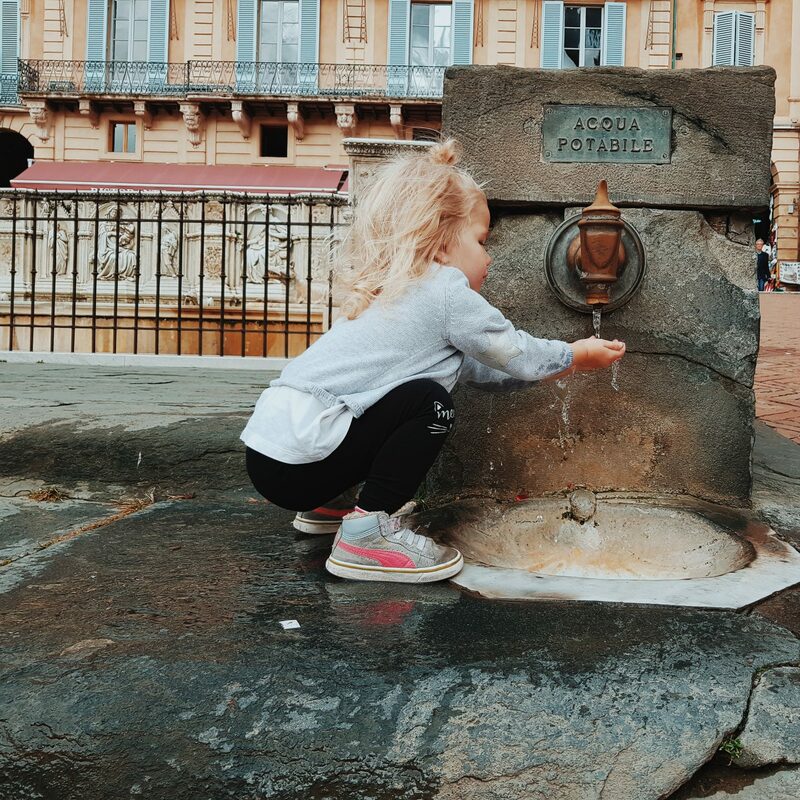 It is easy to explore as it is smaller than other Italian cities we have been to, and it has lots of interesting things for the kids too. To begin with we parked at the bottom of the hill (it was 12 euro for the day) and took about 6 (possibly more) sets of escalators up the hill to get into the city – the kids loved it! 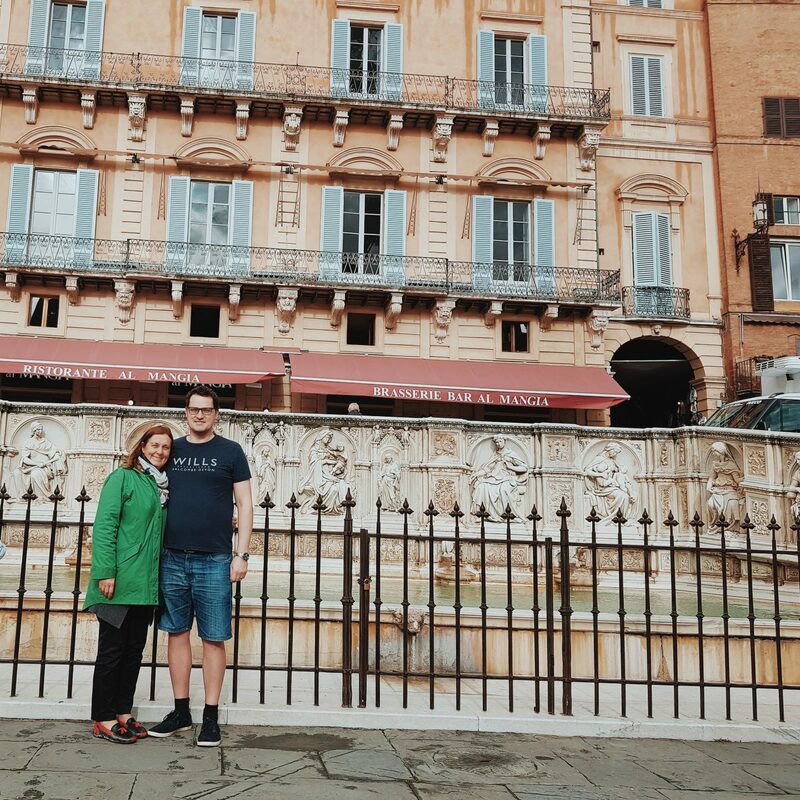 We explored a smaller cathedral before walking up into the city and down to the Piazza del Campo – the famous fan shaped main square. It was such a pretty place full of interesting facts and info. 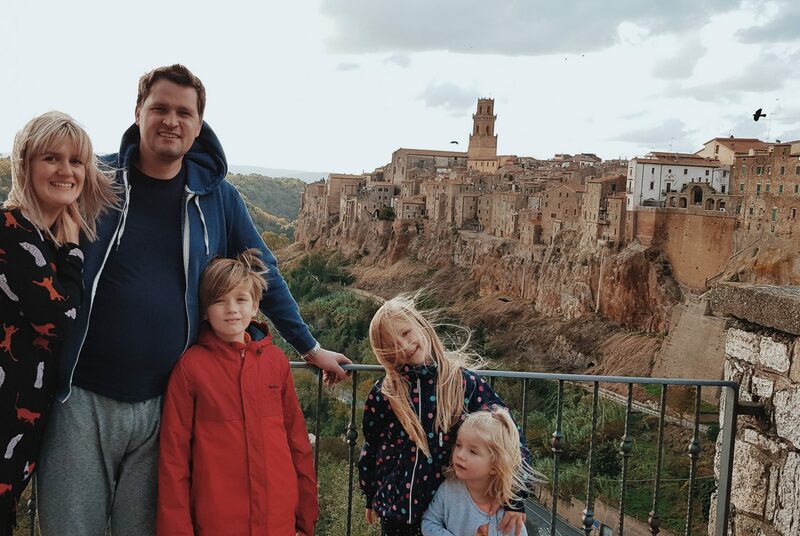 The kids loved running around it and seeing the fountain, but the highlight was climbing over 600 steps with daddy to the top of the Torre del Mangia (famous tower). It cost about 9 euro as children under 11 are FREE! Nath said it was a lot of fun and the views were brilliant! 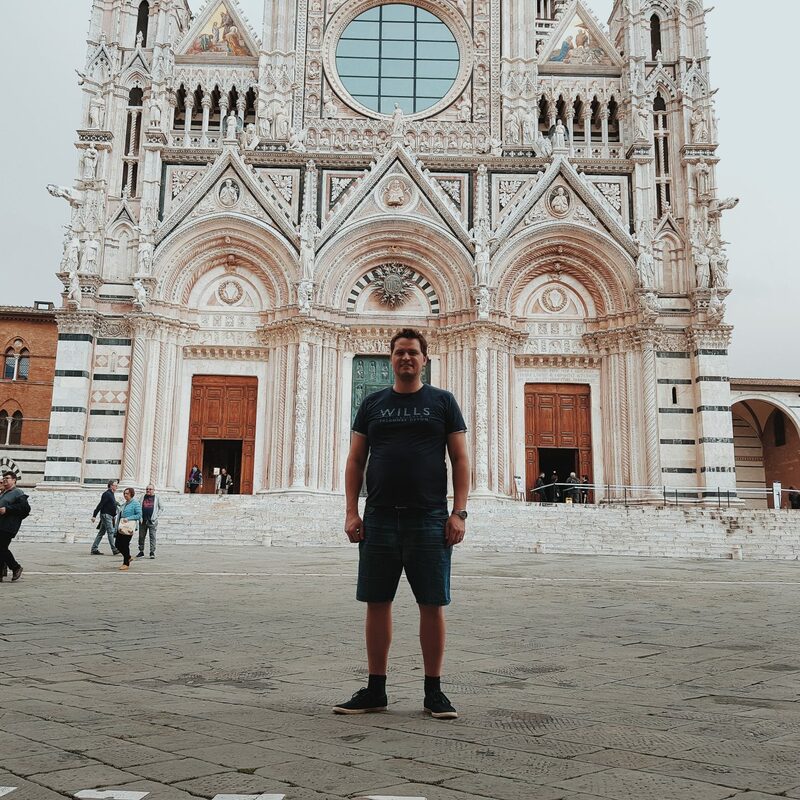 Next we walked up to the Siena Cathedral – a beautiful black and white building that is famous to Siena and again the kids were free here too. Inside it was incredibly beautiful and its history very interesting. 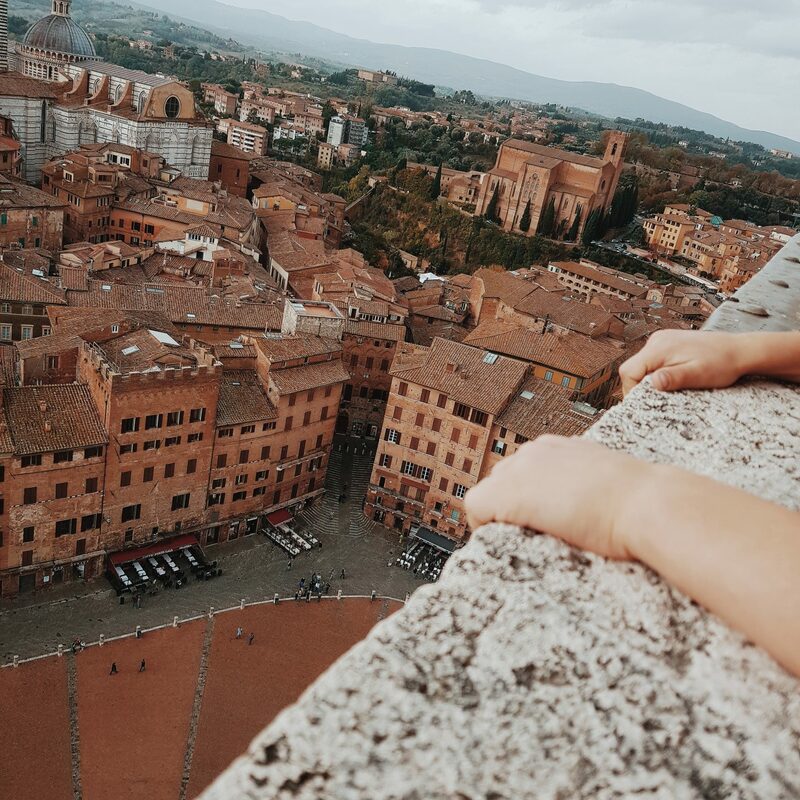 It took longer than planned to build as the onset of the plague took many of Siena’s residents, meaning the man power wasn’t there! Now it stands as an Iconic building, ornate and beautiful for tourists and those who worship! Finally, after lunch we enjoyed a FREE visit to Siena’s Natural History Museum. Whilst small it is jam packed with animals (stuffed), geology and an underground exhibit. It is housed in the old monastery, which in itself is a beautiful place to wander. The kids really loved this part of our day and it was a lovely end to a lovely day. 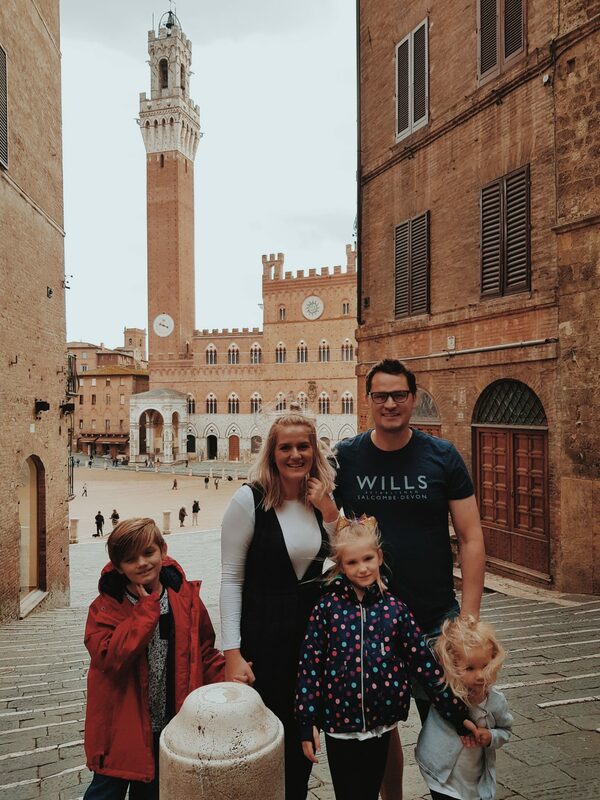 Siena was a very family friendly place and we loved our day out there. 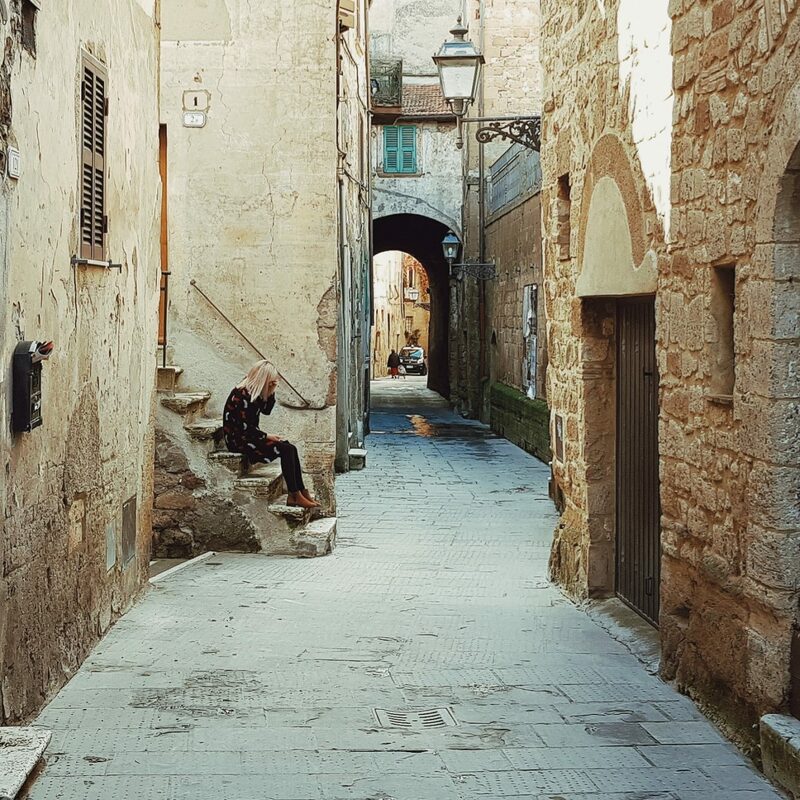 One of our favourite visits was to Pitigliano with it’s quaint old town known as “little Jerusalem”. It was a good hour and 45 mins away from where we were staying, but it was most definitely worth the drive. We decided to go here after Grandma had seen it on Jamie Oliver’s Italian tour. 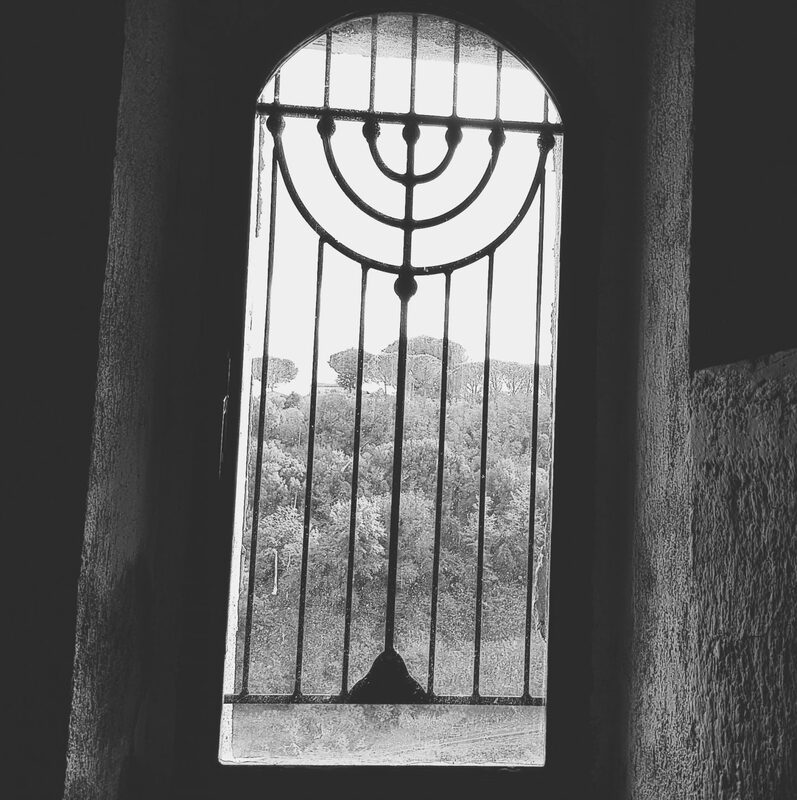 It is carved out of the hillside and has a long Jewish history which is both sad and fascinating. On the way we passed through another hillside town which was equally exciting to look at. We parked near the new town (3 euro) and walked 5 minutes across the road and over a bridge into the old part. It was such an exciting and beautiful place to explore,with lovely views across the valley and a quiet chilled vibe. 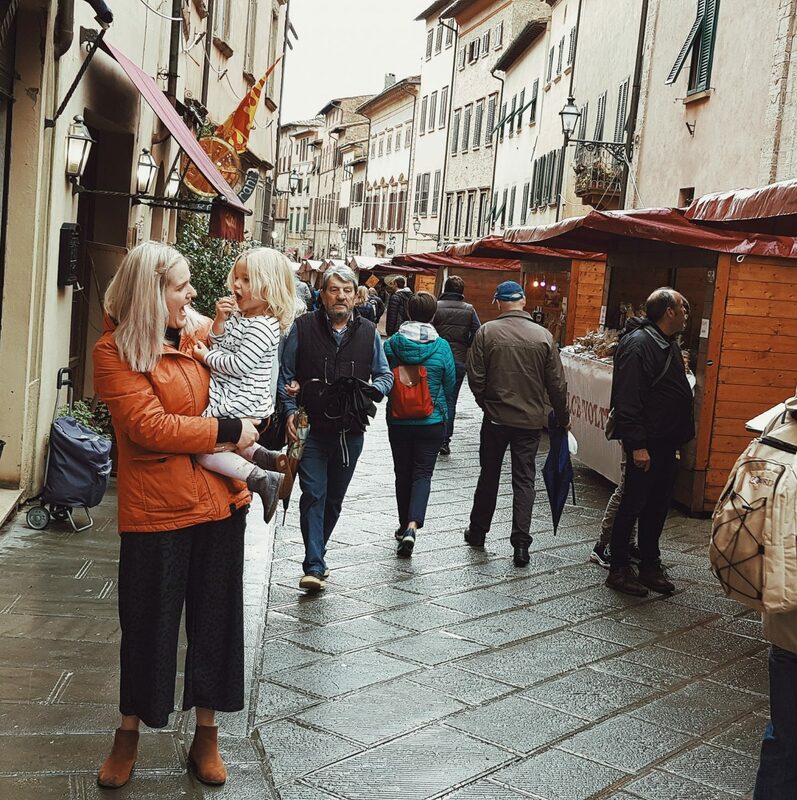 We wandered the little streets – taking it all in and enjoying the mild sunshine. 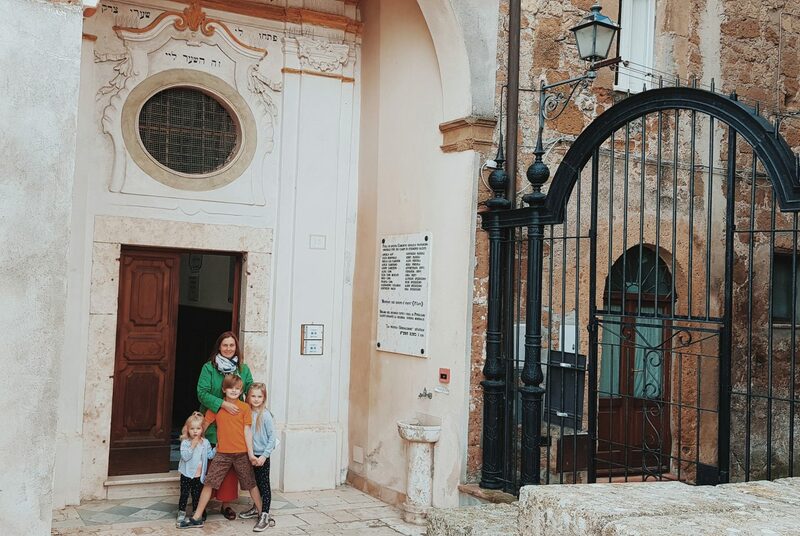 We headed down to the Jewish quarter where we toured the old Synagogue and learnt of Jewish tradition, as well as stories of the Jews in this area (specifically in world war 2). 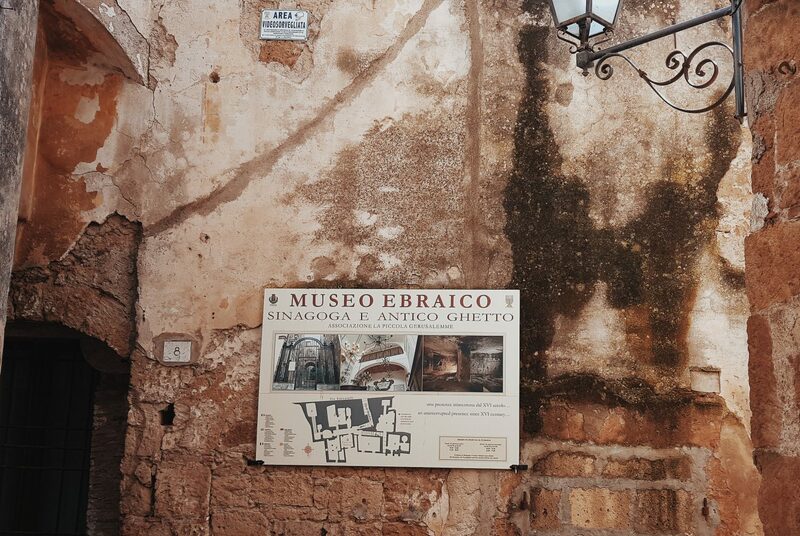 It was a great place to explore and we were touched by their stories. 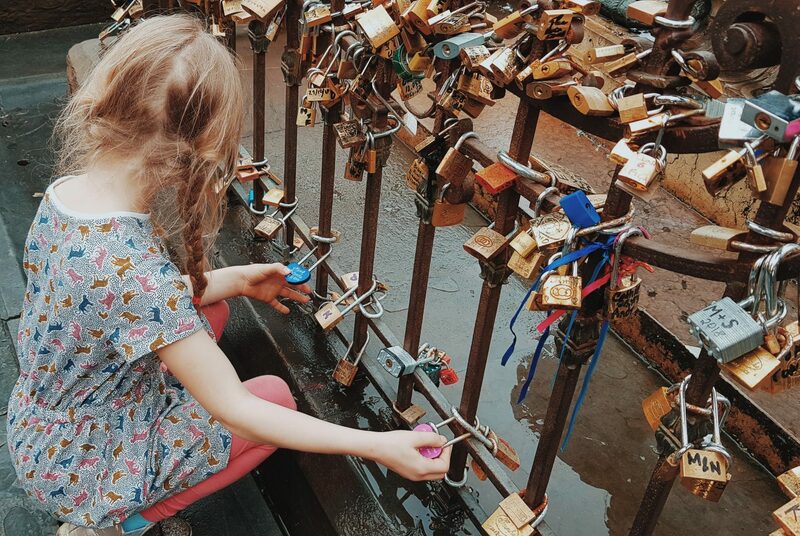 After visiting the Jewish quarter, we did some more exploring before enjoying Bruschetta and “wild boar” lasagne for lunch in a cute little place down the main street. 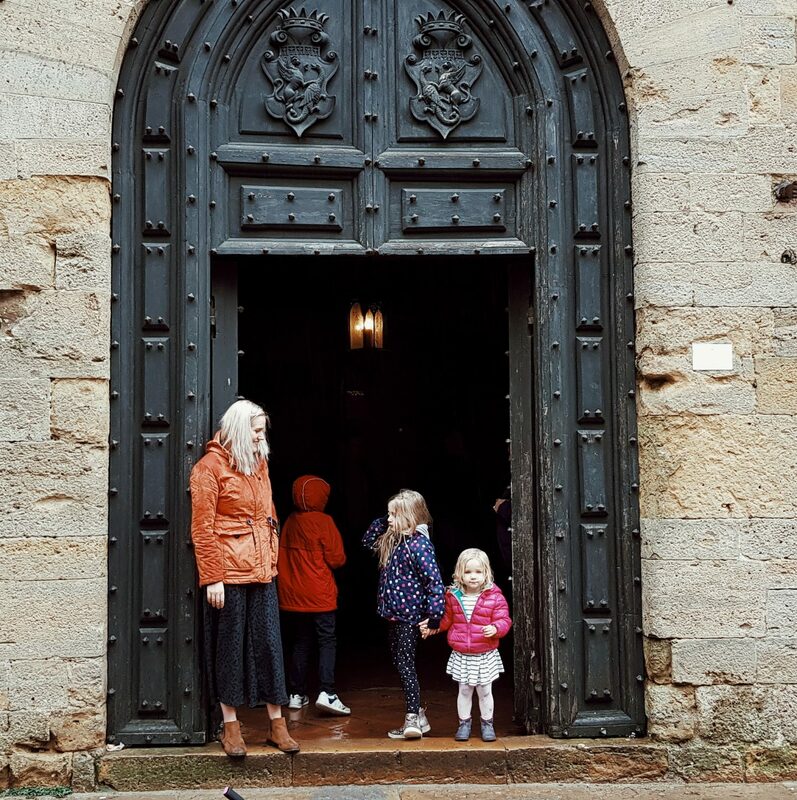 We all loved Pitigliano and you need it on you wanderlust list for sure! 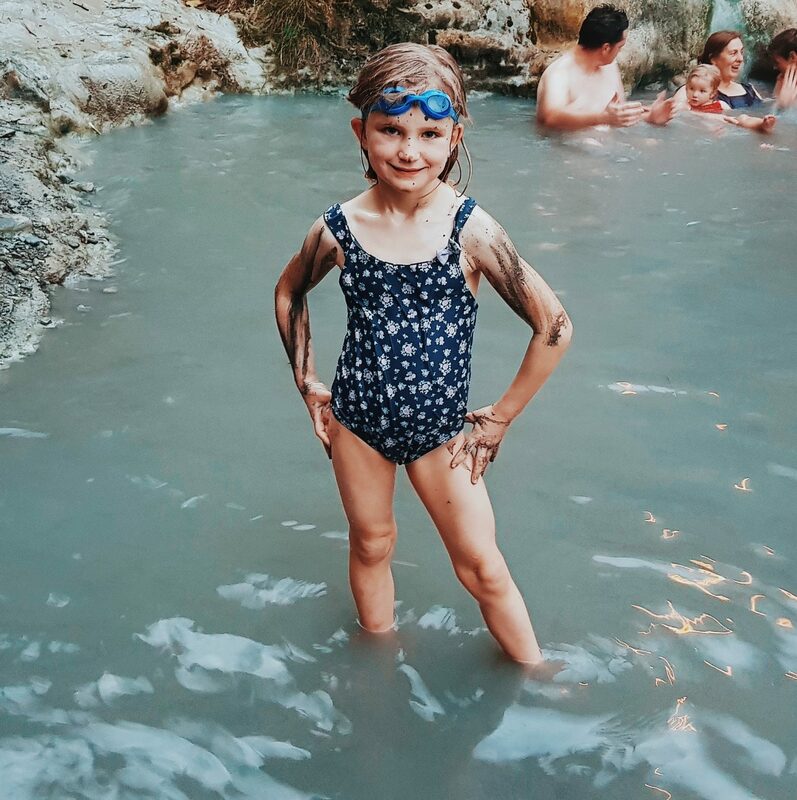 Thanks to several travel blogs, our research of the Chianti region led us to the natural hot springs of Bagni San Fillipo and I think it’s safe to say that they were the highlight of the trip (especially for the kids). 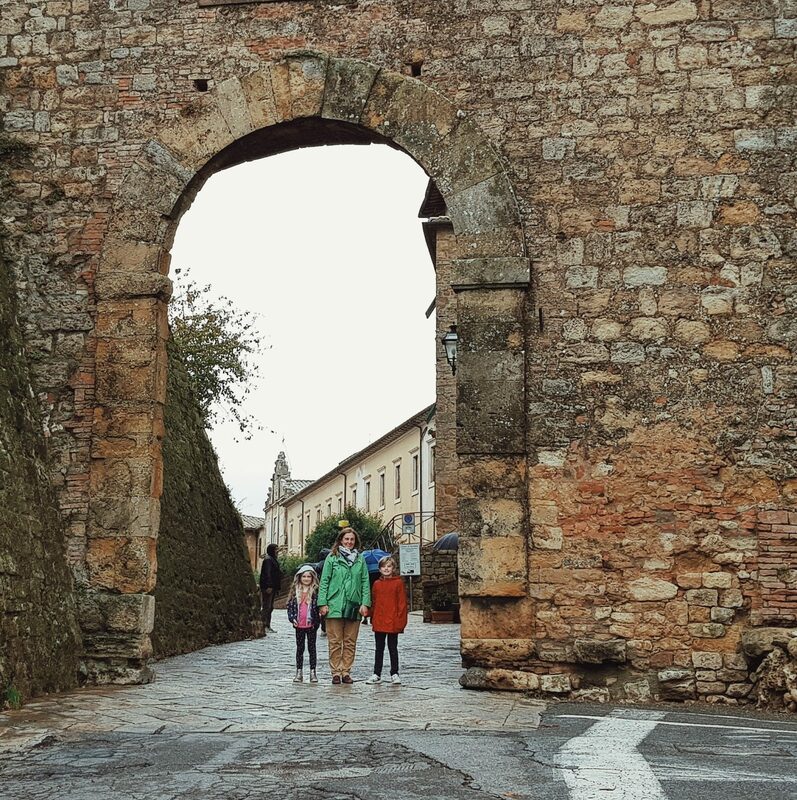 We went late afternoon on our way back from Pitigliano and stayed til dusk – it was so surreal and Idyllic. We paid a couple of euros to park on the road and then walked 5 minutes into the woods where we saw several pools and people enjoying them. 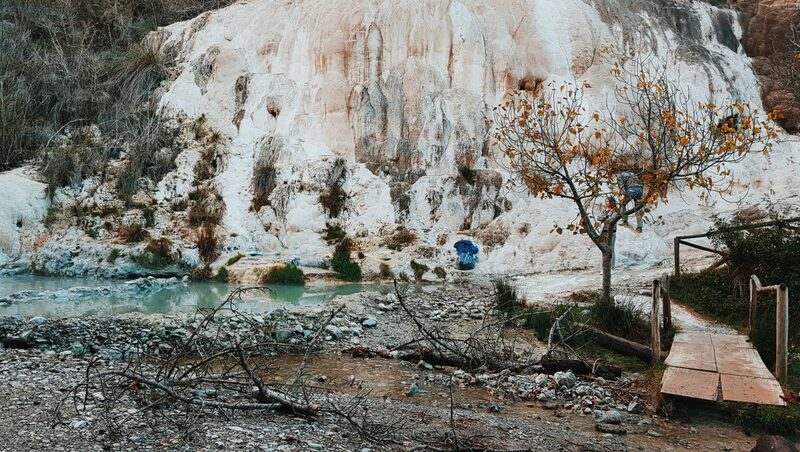 We all changed in the woods (which was pretty funny) and then walked down into the top pools just next to the bridge. They were shallow enough for the kids to play in safely and Megs enjoyed making the most of the “mud bath”! 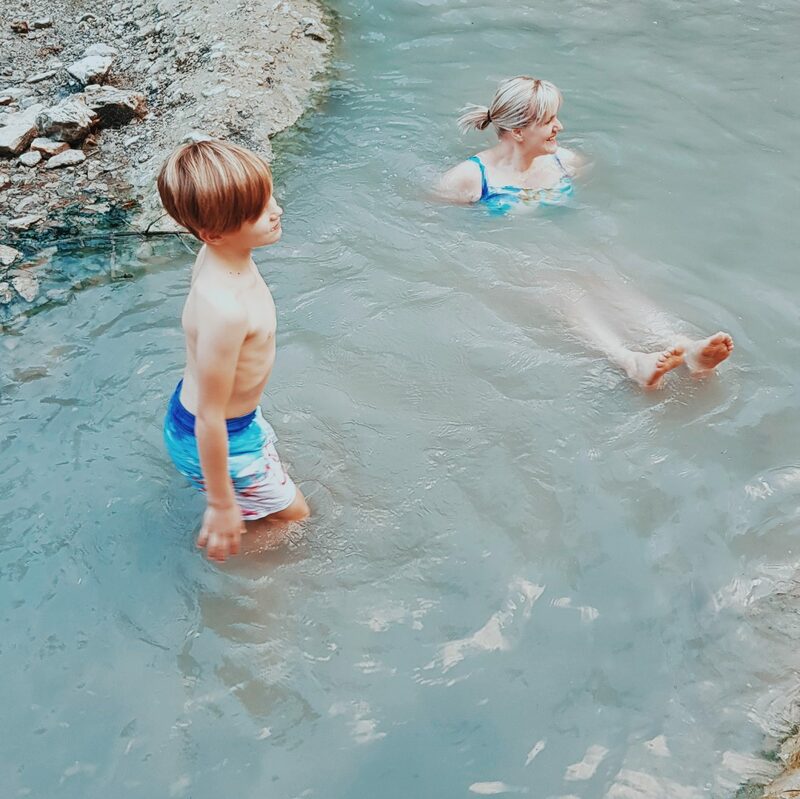 We couldn’t get over how exciting it all was and laid in those warm sulphurous waters in the middle of the woods till dusk – it was glorious! 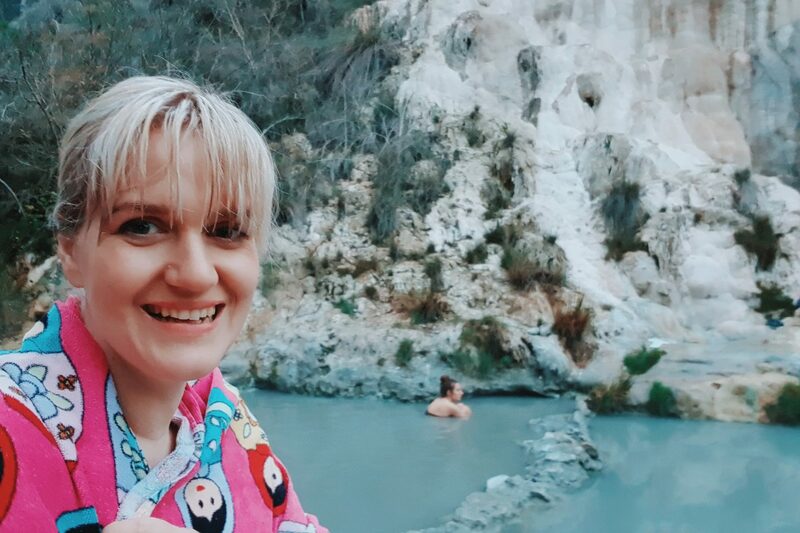 I had no idea that Tuscany was so rich in Thermal springs (there are loads if you google them), but what a natural treasure they were (and FREE too!!). 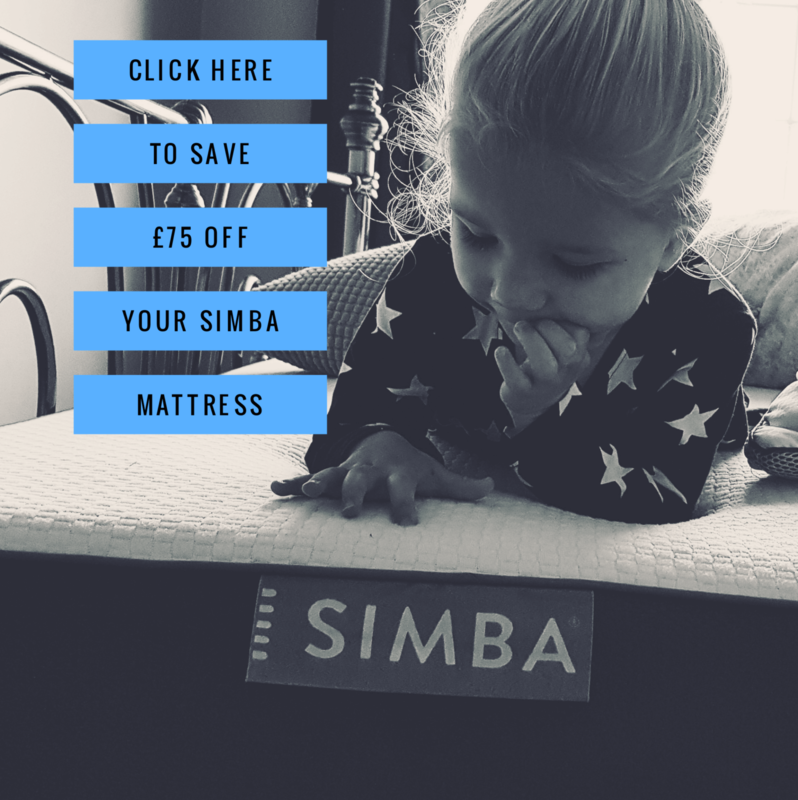 Whilst we all stunk a little afterwards, our skin was soft, our bodies relaxed and it really was the ultimate adventure for the kids and us all! 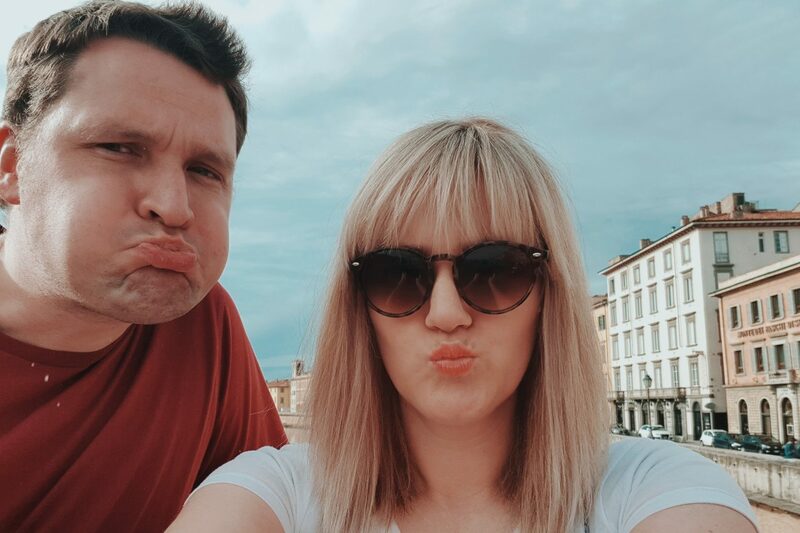 On our last trip to Italy we had a day in Florence and whilst lovely, it wasn’t my favourite! This time however we had Nath’s mum with us and as an avid gardener we thought it would be nice to find a garden to visit with her. 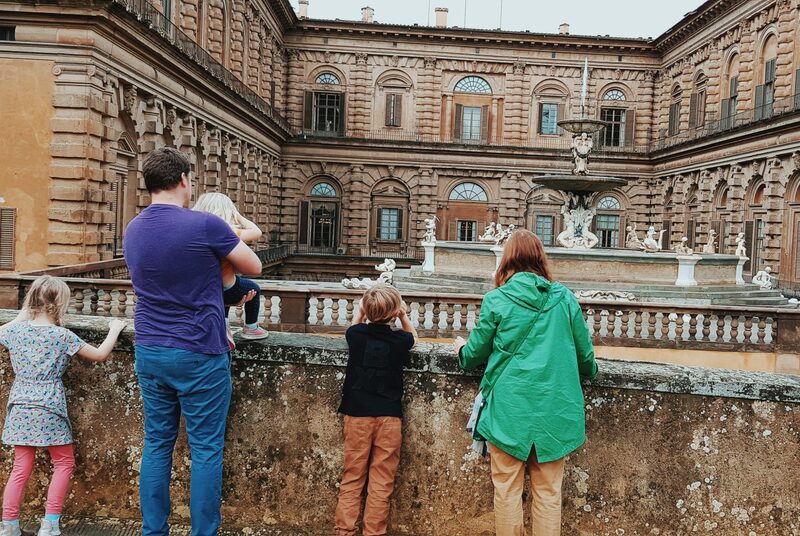 Our research led us to Boboli Gardens in Florence and all I can say is that they were mint! One again kids were free here and as we went on Nov 1st it was “out of season” so tickets were only about 8 euro for each adult. 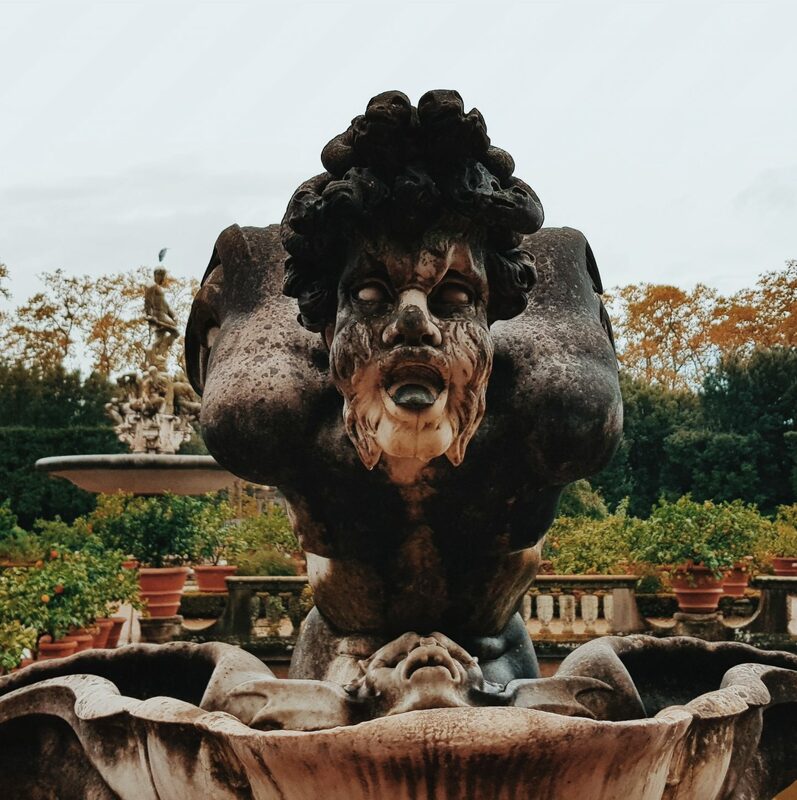 The gardens were huge and are considered one of the most famous in Italy. 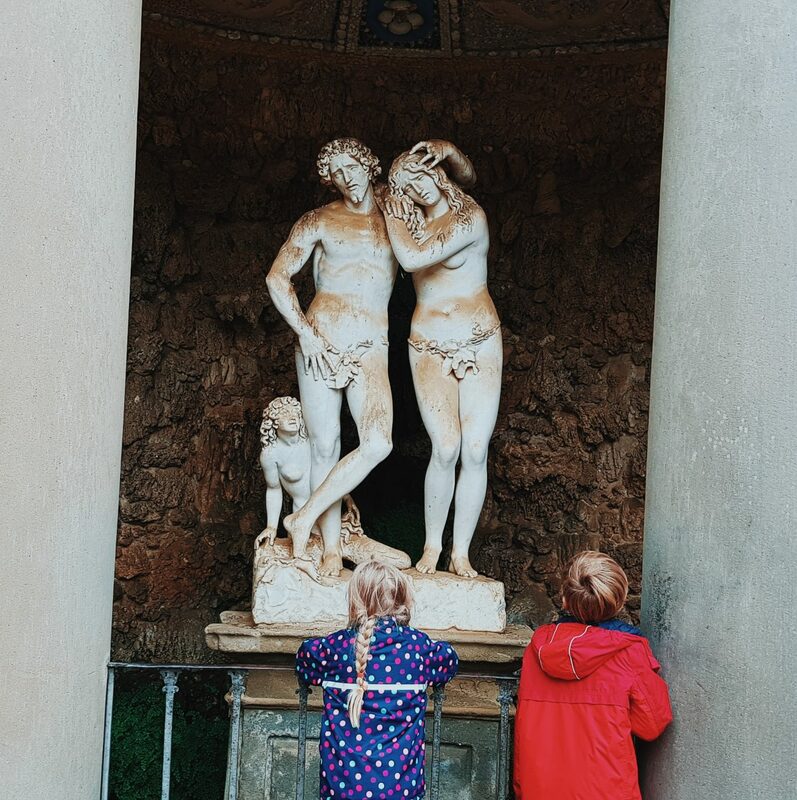 Not only are Boboli Gardens beautifully landscaped and home to many lovely trees and plants, but it is also an open air museum full of fountains, statues, sculptures and exciting things to discover! 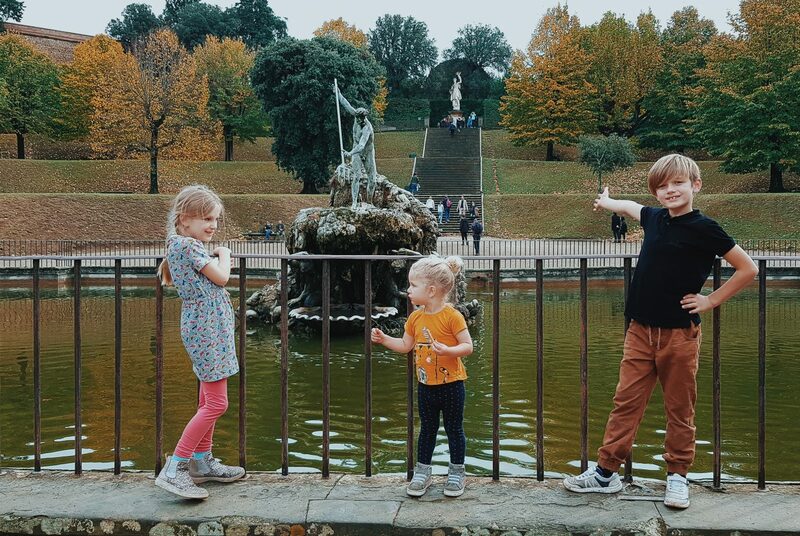 The kids really loved it here – they enjoyed exploring and hiding and loved seeing Neptune, “a giant mento’s” and all of the fountains – I wished we had known about them on our last visit because they are an excellent family day out. 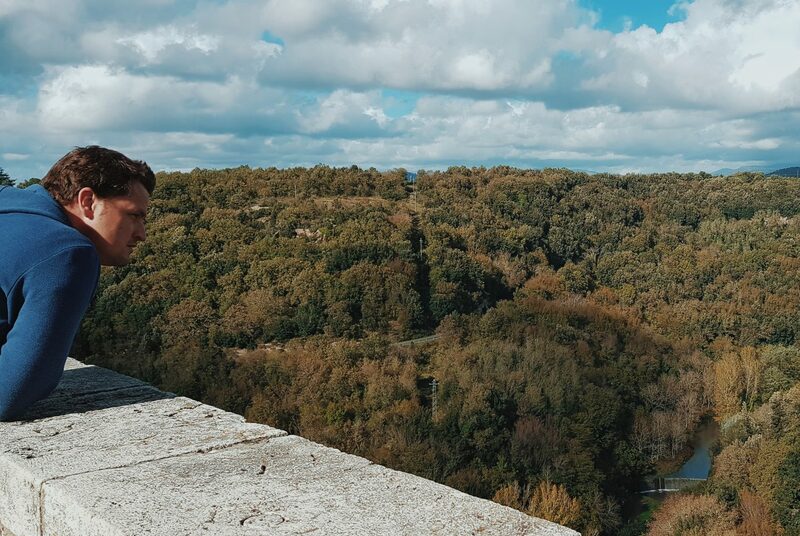 Boboli gardens aren’t flat and in some places incredibly steep. 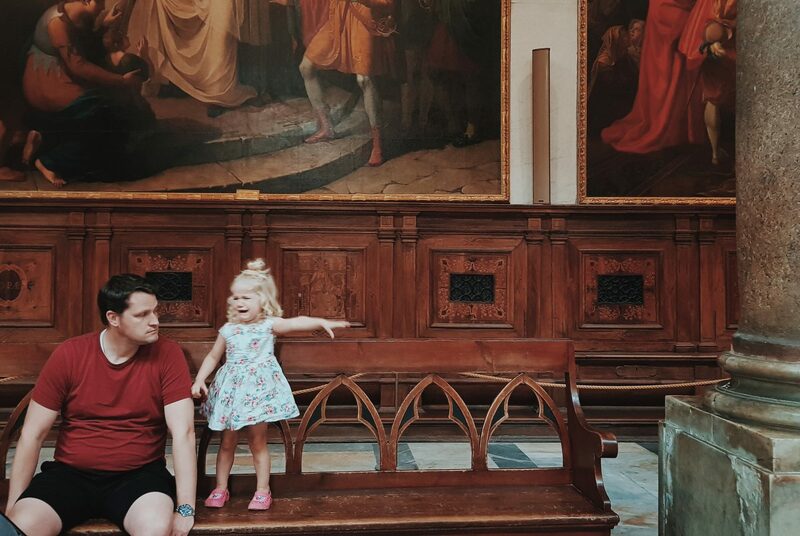 They do however offer hours of fun, great views of florence and beautiful art and landscaping! 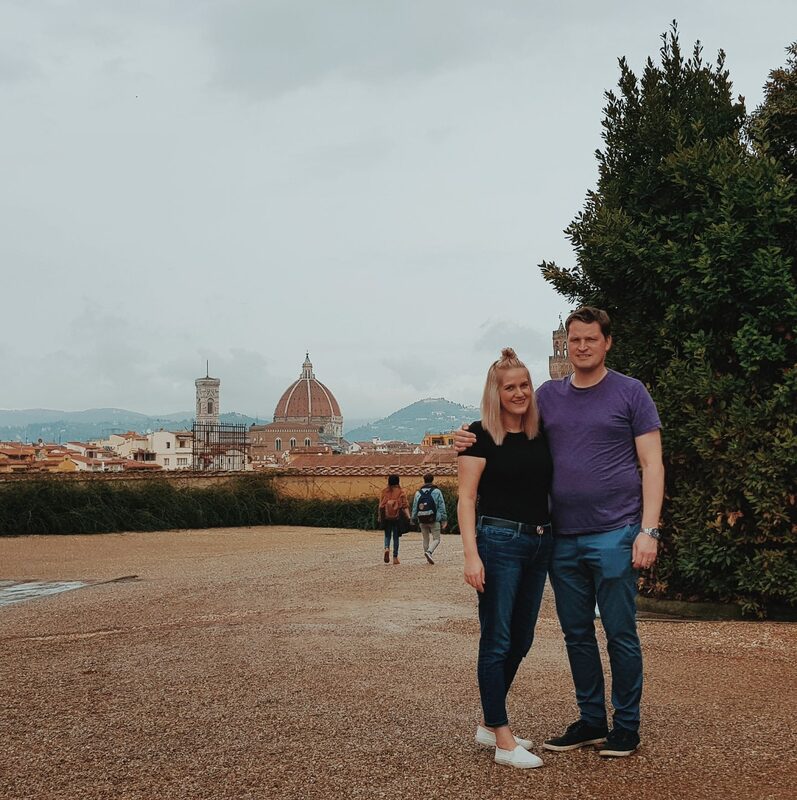 It was a lovely sunny day in Florence when we visited and I loved the views of it from this side of the city. The Piazza is included in the ticket price (which we didn’t do due to time restraints) but the gardens were certainly the highlight on this day out (as well as the Gelato). 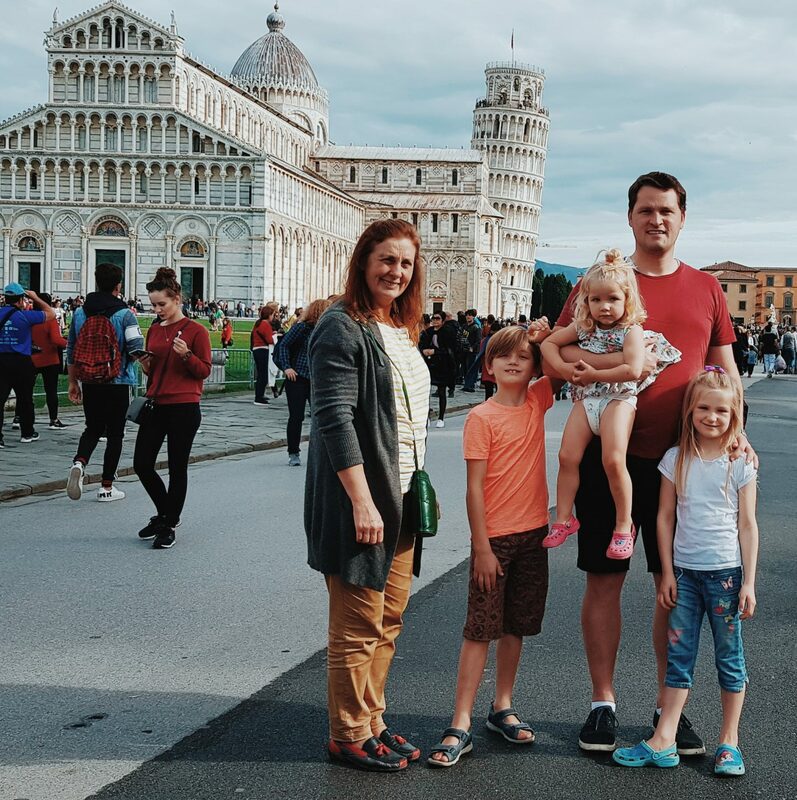 Our visit to Florence this time was certainly more enjoyable than the last and was only an hour and 10 from where were staying. 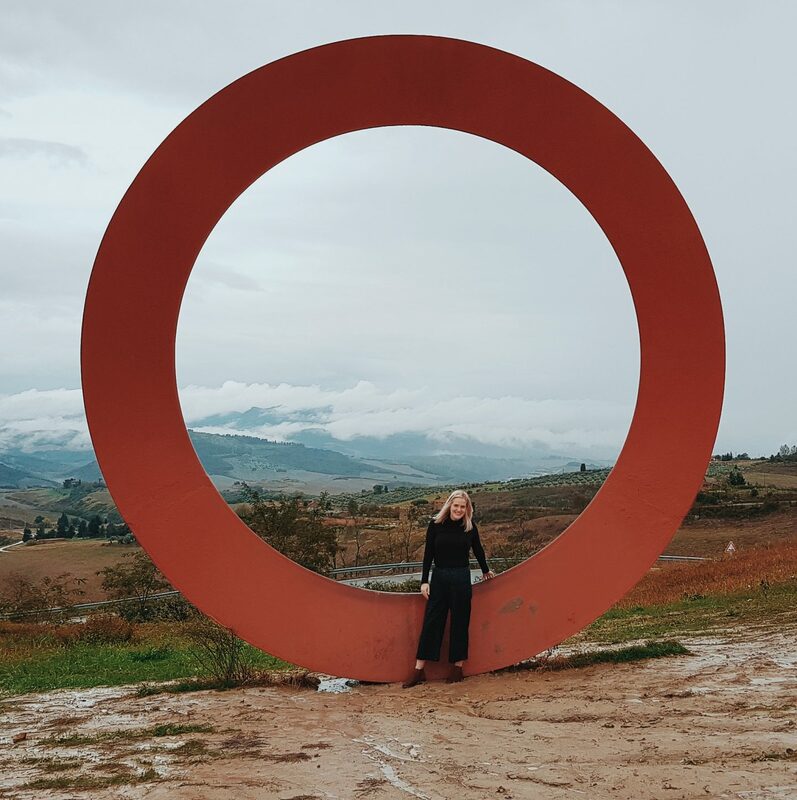 I have been intrigued by Volterra ever since reading the Twilight books, and whilst it wasn’t the location for filming new moon (that was Montepulciano near Siena) it was the inspiration for it and it also has a magnificent history dating as far back as 7 B.C. Positioned high on a hill and surrounded by a wall it is a quirky place just waiting to be explored! 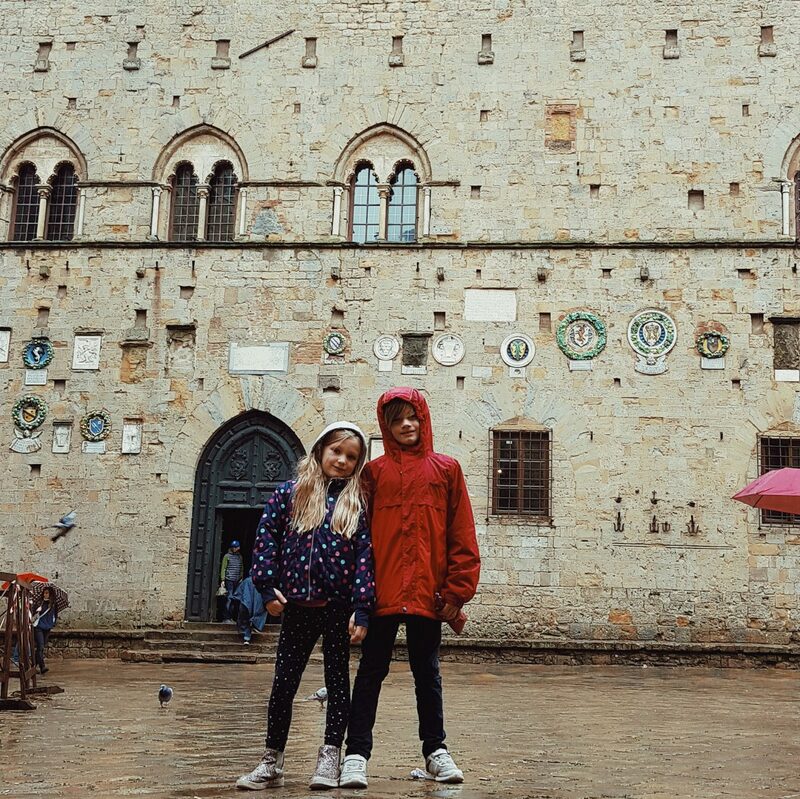 We only spent a couple of hours in Volterra as it is small and that is all you need (and because the weather meant it was a bit of a wash out too, but we won’t mention that!). We parked opposite the Roman ruins where it was significantly cheaper than the train station (it only cost us 4.50) and walked up into the town. We visited on the Friday of our holiday which conveniently turned out to be market day; hosting all kinds of local sellers with free samples happy to invite us to try! This made the visit extra exciting and from cheese to honey and chocolate to biscuits, we all embraced sampling and exploring the stalls. I bought some lemon pasta and the kids some mini jars of honey. It felt so lovely wandering the stalls and looking at all of the delicious treats and foods. I love markets, especially when on holiday, and I love looking at local foods and the things people have made. From here we headed towards the Piazza – home to “The Volturi” in Stephanie Meyers “The Twilight Saga”! The downstairs of the Piazza was free to walk around and so we explored that together (and sheltered from the rain) before enjoying paninis for lunch. I hoped to tour the top of the Piazza too but due to language barriers they couldn’t agree a price for the kids (one said free one said 6 each?! 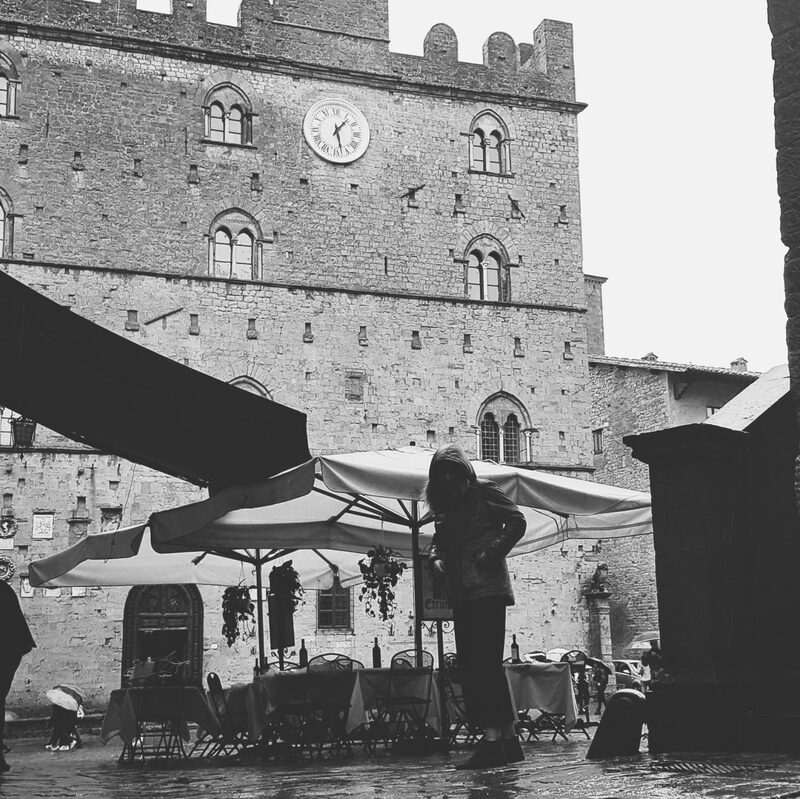 )..Either way Volterra was a beautiful town in a beautiful location and we loved exploring it’s streets and visiting the market and Piazza. I am glad I finally went! 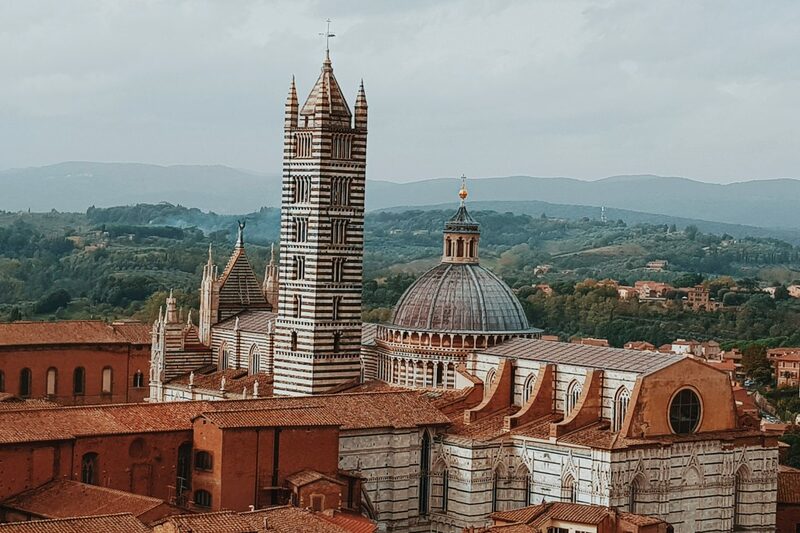 We flew in and out of Pisa, and so it was only natural that our trip to Tuscany would wind up here. It was a 2 hour drive from where we stayed, but armed with snacks for the kids and “The Greatest Showman” soundtrack on repeat, it was fine. The weather was 22 degrees C when we arrived late morning and it was a lush way to end our holiday. 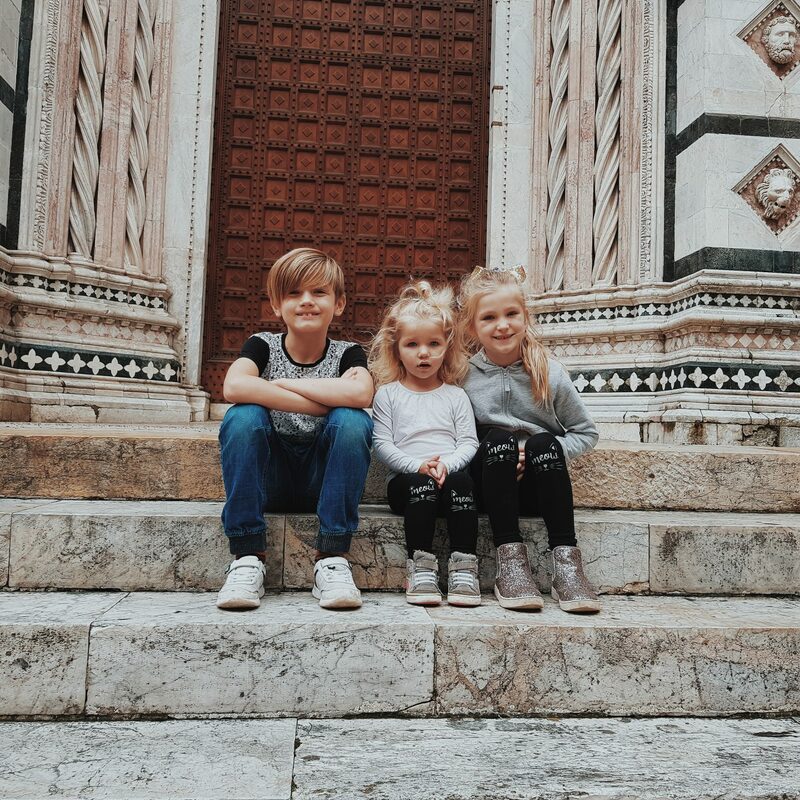 We have obviously been to Pisa before as it wasn’t far from where we stayed last Summer, but Grandma hadn’t and so we enjoyed showing her our favourite spots. We wandered around the cathedral (which is free to look in – you just need a time slot ticket to manage crowds) and posed by the tower again. We then walked along to the river but didn’t have time to go to the park/gardens at the other side. 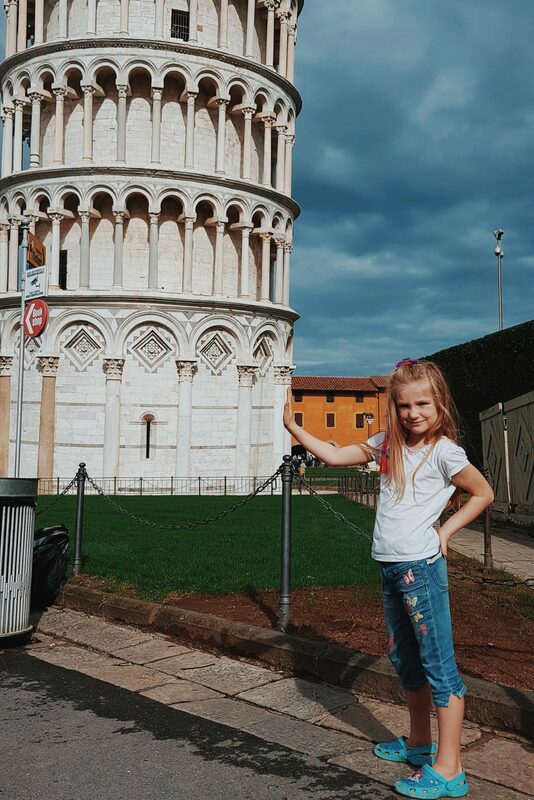 Pisa is such a lovely little City and another kid friendly one too. It was great to spend a couple of hours here again in the sunshine before checking in and flying home to London! 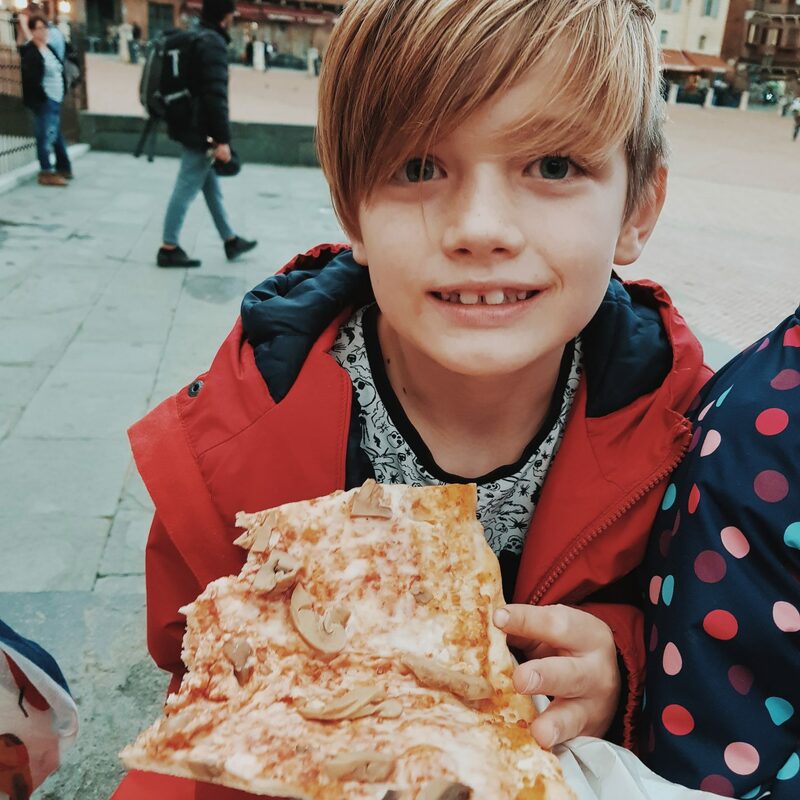 I really love Italy – it is a place full of my favourite foods, and is also a place I never tire of exploring. The weather was pretty nuts whilst we were there (as were the kids) with a couple of big storms and a power cut, but we also had some lovely days of mild sunshine that saw us dipping our feet in the pool and wearing just T-Shirts. 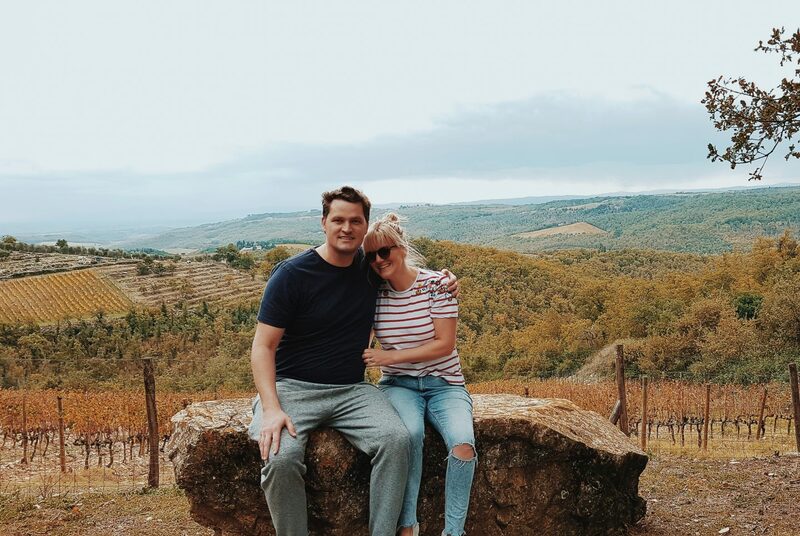 We had a relaxing stay with “To Tuscany” in the Chianti Hills, eating local foods and playing games in front of the wood burner by night. 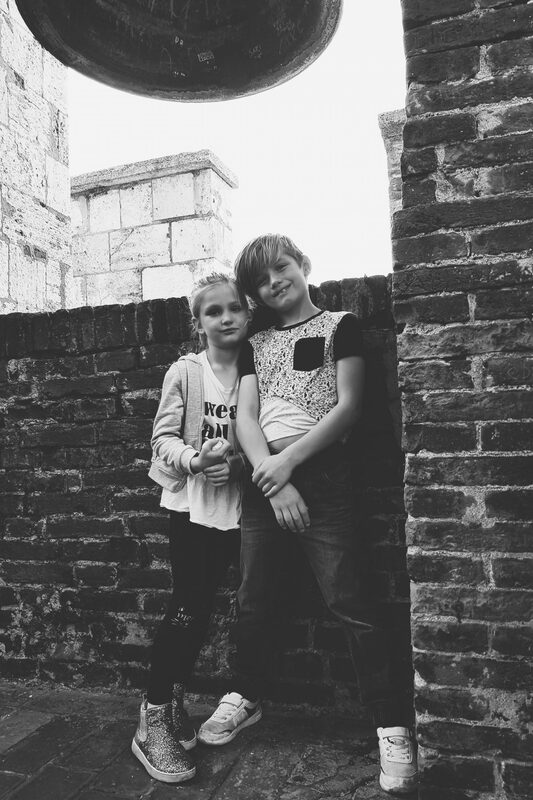 The places we went to and the memories we made, made it a wonderful Autumnal adventure for our half term and we loved it (mostly). 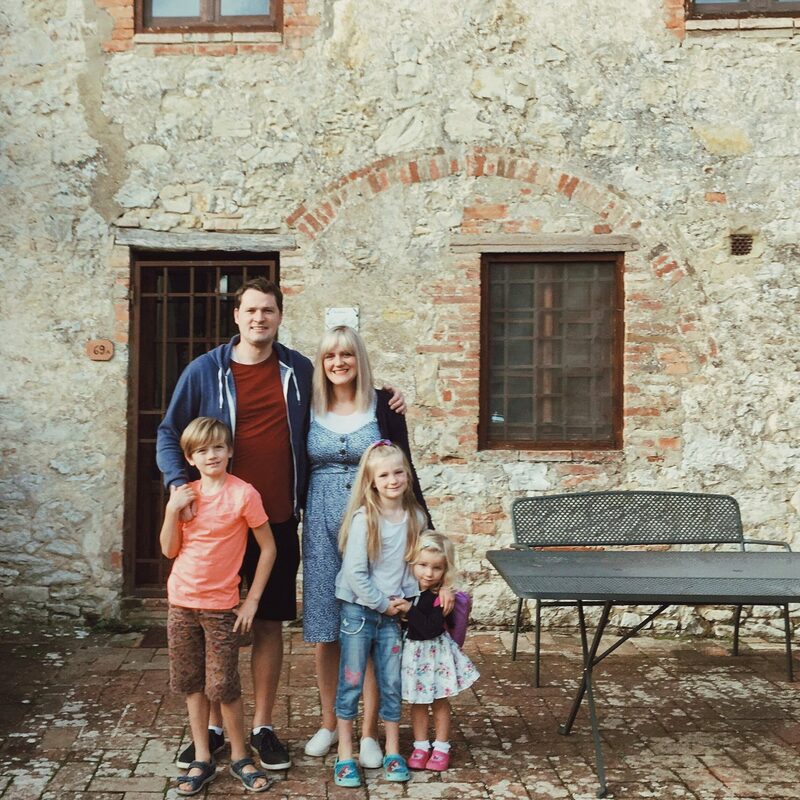 Our villa was quaint and ample and the views were breathtaking – I loved waking up every morning and taking them in! 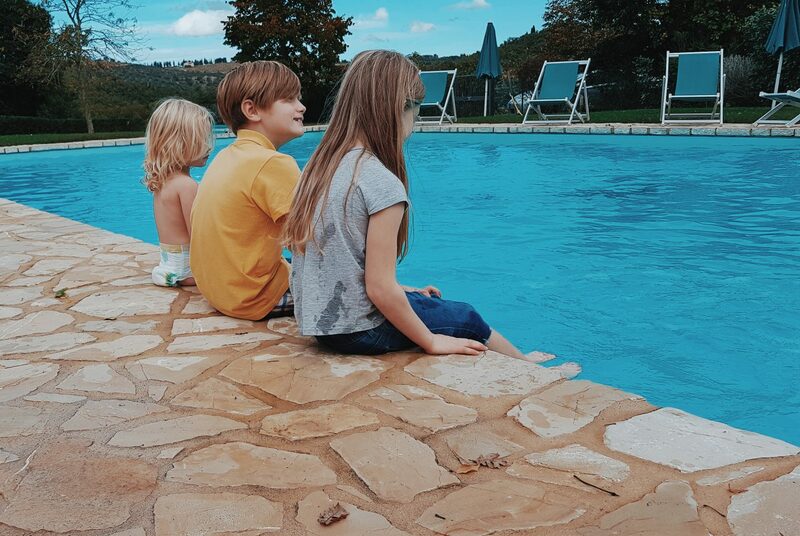 With a pool only 2 minutes away from our villa, I can imagine in the Summer it is quite the place to sample foods, wines and sun rays – far away from the ordinary and truly picturesque! 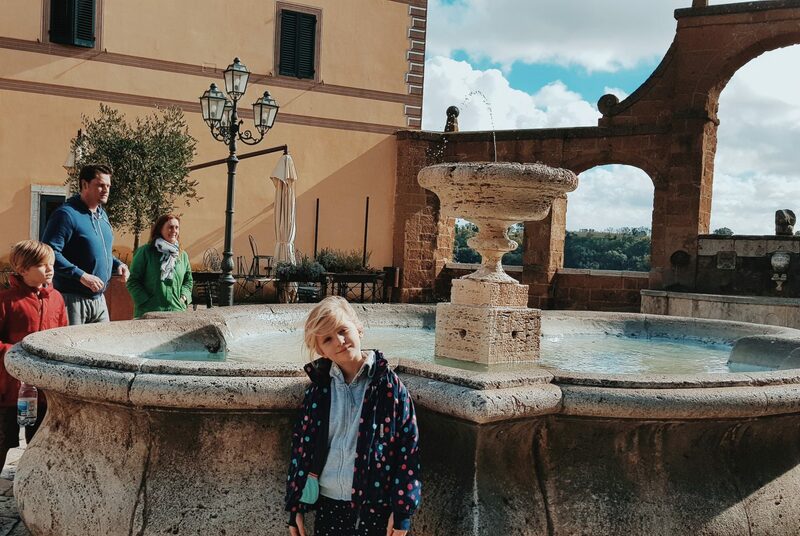 Thank you To Tuscany for a memorable and relaxing Tuscan adventure this Autumn – we had a fab time! 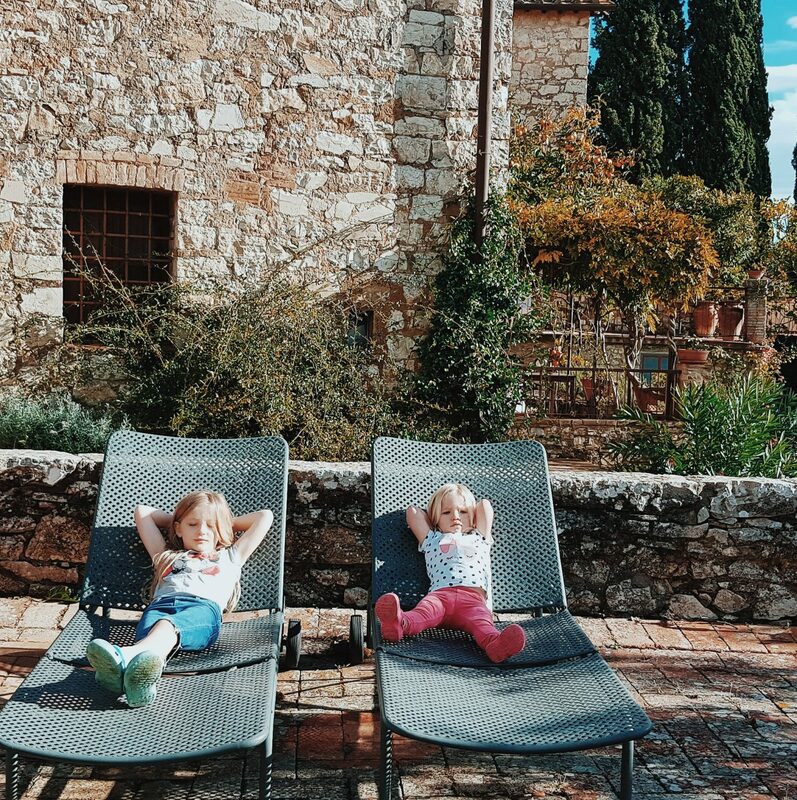 * We received this holiday complimentary from To Tuscany after winning their blogger competition. All images and thoughts are my own and we are incredibly grateful for this adventure.